I don’t have many hobbies. I don’t know why, I think it’s my father’s fault. He was always a workaholic so I think it’s a bit of his legacy in that when I’m supposed to be relaxing, I’m usually working, or thinking about working. Case in point… it’s Sunday morning and here I am writing a blog about… work. However I’ve come to peace with this a while ago. The thing is, I like many aspects of my work and so if they give me more enjoyment than fishing or golf then I’m not going to feel guilty about it anymore. So, most weekends you’ll find me reading magazines like Sound on Sound, or reading tech blogs and trying to stay up with the latest developments in the world of music technology so that I can make smart choices about what gear I should be purchasing for my music department. But, this has a big downside that I’m constantly having to remind myself of. Just because there is some great new piece of recording equipment that I think I could use really well, doesn’t necessarily mean it’s going to be a good choice for my students who are not as obsessive about gear as I am. And it’s worse when it comes to software. I have to say when people look at Pro Tools on our school recording computer and see we have 20 different types of compressor plugins available I get a little embarrassed. At times I’ve lost perspective about whether some new plugin will really make a difference to students who are struggling with the fundamentals of how a compressor works in the first place! So, while I believe I have the knowledge to put together the most incredible recording studio setup in any high school around, is this what is actually best for students in the long run? Well, yes, and no. I love it that students in my studio get to work with gear they’ll find in most professional studios any where in the world. 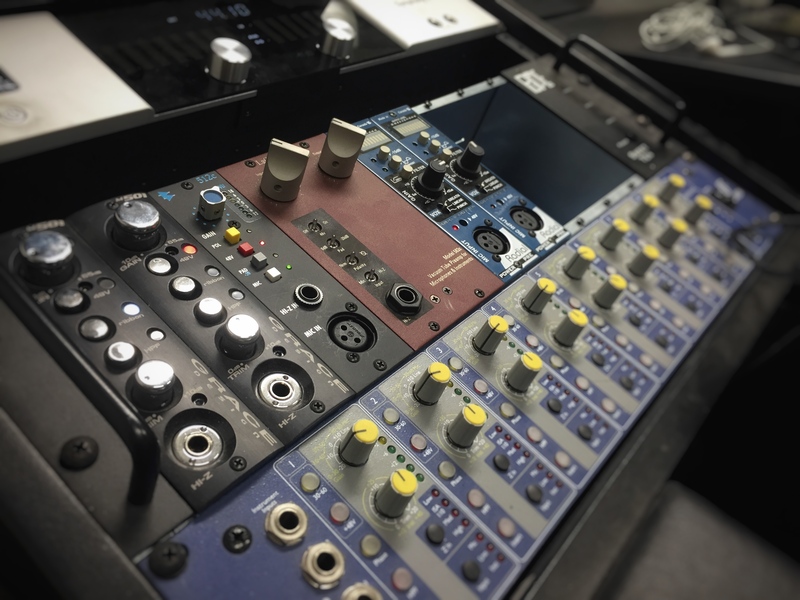 When I take students to see professional studios or to visit Tertiary institutions that run recording programmes it is very gratifying for them to see equipment that they already know how to use like the Apogee Symphony, preamps from Grace, API, Focusrite, La Chapell, microphones from Royer, Neumann, AKG, Shure and so on. But for the student that is more into making music than being obsessive about gear (and without being sexist, I’d put most girl students into this category) the gear needs to serve the music… not vice versa. (And to be honest, it should be like this in all situations… if a recording setup is too complex that it interrupts the creative flow then it needs to be simplified). So, for those NZ teachers that are now accessing STAR funding or putting together budget for PTA fundraising I encourage you to come up with a statement about the philosophy of your school recording setup long before you start researching what gear is the best for you. Otherwise you’ll end up making the same mistakes like I have… i.e. purchasing gear and software that rarely gets used (I make it out to sound I’ve been really bad at this, but I’m not really, overall I’m very happy with what I’ve done, but I have made some mistakes). I would encourage teachers to put together a studio for the purpose of fostering a creative environment that allows students to get their ‘voice’ heard, that will enable them to take the songs they write and to get them out into the public. This is the way of the future… how many compositions that students create in a traditional format using ‘Sibelius’ ever see the light of day? But students that record songs and upload them to Soundcloud or YouTube create works of art that will never disappear. Interface/mixer – I’d recommend an all in one unit like the Behringer X32 rather than a separate A/D interface and preamps which cost significantly more and are harder to use (but admittedly better quality). Microphones – start with a few dynamic microphones that can be used on a variety of sources. Shure SM57’s and SM58’s are the obvious choice. Don’t save money by getting lower cost mics like the Shure PG range – they’re rubbish! Then if money allows buy one good quality condenser mic for recording solo instruments and voice (I love the AT4050 but there are many, many more options available from companies like Rode and AKG). Speakers, headphones and cables – don’t go crazy with these. Obviously you’ll get better quality the more you spend but for your initial setup go with whatever you can afford. And that’s it! All this is around $5000 NZD (not including computer or recording software). It’s simple, sounds great and is easy to understand. Obviously there is a great need for quality acoustics (which is the main advantage professional studios still have) but to get up and running with a music tech syllabus this should do everything you need. And whatever you do, don’t start getting hooked into plugins from companies like Slate, Waves or others. Keep it simple, stay with stock-standard plugins so that the focus is on how to use them, rather than having the students thinking that a single ‘magical’ plugin will make them sound amazing the create professional sounding mixes.